(4-19) Maggie Mason describes herself as an “adult-onset athlete” as she wasn’t athletic at all as a kid, kind of shrimpy and always picked last for every team. That changed in the second half of her life when the Santa Barbara resident discovered running, and used it to overcome depression and excess weight. She’s getting ready to retire after 30 years of teaching English at the high school and college level, and will no longer have to squeeze all her training into the pre-dawn hours before work. Mason, now 62, guesstimates her lifetime miles at 50,000. 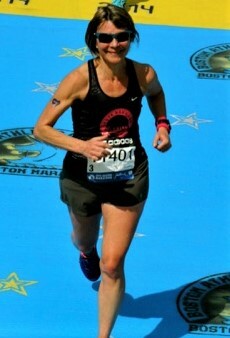 A little more than two years ago, she ran a 3:23:02 marathon on her 60th birthday. When and why did you start running? July 1983. I was in my mid twenties and went to a party with a guy I had a huge crush on, and then he left with another girl. Stuck with no ride, I ran all the way home—about a mile—and I wasn’t even winded. I enjoyed it and started running the very next day, and continued to run for fitness for years. I stopped running in the early 90’s, as I was married and trying to start a family. For about five years I underwent extensive infertility protocols. My doctor advised me to stop all strenuous aerobic exercise during the treatment. I never got a baby, but I did get fat, due to the combination of strong fertility drugs, lack of exercise, and depression, which resulted in a weight gain of over 45 pounds. Going from a trim 120 to a peak of 165, I hated my body. At age 40 to reclaim my body, I started biking 25 miles to work and back every day, refusing to take a day off, even during a two-week period of Santa Ana winds and 95-degree heat. As a result, I severely strained my knees and couldn’t even walk. My doctor told me to change up my activity so I went back to running. I ran 8-10 miles a day, five times a week, and loved it. I had finally found my sport. After a few months of doing what I thought then was an insane amount of mileage (40-50 miles per week), I said to myself, “I bet I could run a marathon.” So I did. 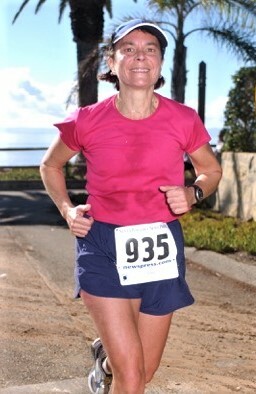 A marathon was my first race at age 42. Since then, I’ve run 23 marathons, and countless shorter races. How much did you run per week in your peak years? Now? My peak years were in my late 40’s/early 50’s, when I was running 55-65 mile weeks, topping out at 70 during marathon training. Now, I run 40-50 mile weeks, peaking at around 55-60. What were some of your better/memorable races? Boston 2002. I was newly divorced, running the Boston Marathon “for fun,” because I had just run the L.A. marathon in March. Running really helped me grapple with all my demons. I wasn’t expecting to race well in a marathon 6 weeks after a PR, so I was just having fun: slapping kids’ hands, taking oranges from spectators, chatting…all the things I never do when racing hard, and I set a new PR. I’ve since run faster, but that was the dream marathon, the effortless one where I felt fantastic the entire time. Another memorable marathon was CIM in 2013. I sprained my ankle the day before the race while running a 2-mile shakeout, and it was swollen and purple. My coach told me to tape it up and run anyway. I could barely fit my shoe on. I ended up with a great time of 3:19, just 3 minutes off of my all-time PR of 3:16. My most accomplished marathon was on my 60th birthday, at CIM in 2016. I’d set out to break the course record for 60-64. I had to run under 3:24, and I ran 3:23:02. I was ecstatic! I did break the course record, but as it turns out, so did someone else—she beat me by 5 minutes! I didn’t care…I had done what I wanted to do, and was thrilled. What a great birthday present. How did you train differently in your younger years? When I was younger, I ran every day and sometimes did doubles, either biking or a second run. I started taking two days completely off when I reached my mid-50’s, and then began substituting some cross training for pounding the pavement. Has your diet changed through the years? Not substantially, although I’ve incorporated much more fruit in the last decade. I’ve also almost completely eliminated pre-processed food from my diet. I process most of my food myself, although it is labor-intensive. I still do love tortilla chips and cheese and crackers, though, and pizza. I’ve discovered that I love to cook, so I spend lots of time on meal prep. Cross Training: Yes! I purchased an outdoor elliptical-style stand-up bike from Kickstarter about 3 years ago (sort of like an ElliptiGo), and I either ride that or go to the gym for an elliptical speed workout once or twice a week. I also lift weights. When I retire, I plan to hike in our lovely mountains more often, and run errands by walking or biking. How are you adapting to getting slower? Slowing down has been humbling, but I accept it with alacrity. My current all-out miles on the track used to be my 10K and 10-miler pace. But this is my body now, and it gives me what it can. I try to treat it with kindness and respect, and be grateful for the gift it keeps giving me. I love age-graded and age-group results, because they help me stay competitive and excited. Since I entered the racing scene after 40, these measures have been far more meaningful to me than overall results. Obstacles along the way: I’ve had two major chronic injuries during the past 20 years that took me down but not out. One lasted 6 months, an annoying and painful psoas injury. The other, an insertion-point hamstring pull, persisted for 2 years, and also reverberated down my leg, manifesting in multiple other ways, all painful and game-changing. I ran marathons while in the thick of both of these injuries, and frankly, I don’t recommend it. A favorite quote: “In all the activities of life, from the most trivial to the most important, the secret of proficiency lies in an ability to combine two seemingly incompatible states—a state of maximum activity and a state of maximum relaxation.”--Aldous Huxley, from his book of essays, Tomorrow and Tomorrow and Tomorrow, which is out of print and which I highly recommend…it’s really hard to find. Has running helped you with the aging process? Um…YEY-ESS! 1. I always look forward to “aging up” into the next group, so I can stay competitive. 2. Being fit and strong is a great gift as we age, and health is a powerful incentive to run. 3. Because I’m competitive, I run in pace groups with younger women who have become dear friends. They’re having babies now, and I’m involved in their lives. Delightful. 4. Running gives me a connection to life and vibrancy, and reminds me that no matter our age or stage in life, we can find relevance and purpose. I think it was Samuel Johnson in Rasselas who pointed out that forward motion is critical to our humanity. Running gives us that sense of movement and direction. It’s profound. 1) Pace yourself, in all things running. Just because you can, doesn’t mean you should. Respect the workout, the training plan, or the race. Learn to apportion your energy. That takes maturity and restraint. 2) If you feel depleted or unmotivated for weeks or more, it’s time to rest and regroup. Don’t drive yourself to the point where you have to tap out just because you’ve set certain goals. If running becomes drudgery instead of joy, take time off. You will come back stronger. 3) Incorporate variety in your running. Seek out new routes, take off your watch or earbuds, sign up for an out-of-town event, or train for a race distance or terrain you’re unfamiliar with. What are the biggest lessons you have learned from running? Running engenders endurance and resilience, which spills over into life lessons in so many ways. I’ve learned to be more comfortable with discomfort, to ride out the bad patches, to hunker down for the long haul. And to treasure the good stretches! Also, I love the mantra of “hard, easy.” It describes so beautifully not only what is good for our running, but good for our lives and our souls.